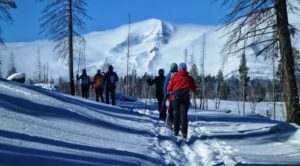 A large number of CONC members hiked Otter Bench on Sunday, Nov. 11, while a smaller group stayed near Bend and hiked along the Deschutes River. Ten hikers accompanied group leader Roz O’Donoghue to Crooked River Ranch for the Otter Bench hike. “A sunny fall day and location provided the group with a perfect shoulder-season hike,” says hiker Ron Hoyt. “Otter Bench is a basalt bench halfway between the Crooked River below and the rim rock above. It’s not clear where the ‘Otter’ in the name came from since the bench is a couple of hundred feet above the river.